This machine was in poor condition when it arrived at the Boleyn Workshop. It had been purchased for use in a stone cutting yard. It was intended for regular use but never actually saw any action (bit like buying Kieron Dyer) and became surplus to requirement. The pillar had a major kink and several dents which had to be ground out in order to make it stand straight again. It looked like it had toppled forward at some point to do the damage. The return spring had broken off so a hole had to be drilled at the end of the spring so it could be reattached. The original paintwork was mostly missing with lots of bare metal and some random paints seemingly been thrown at it. I decided to repaint it using the closest match I could find to the Walker Turner grey. 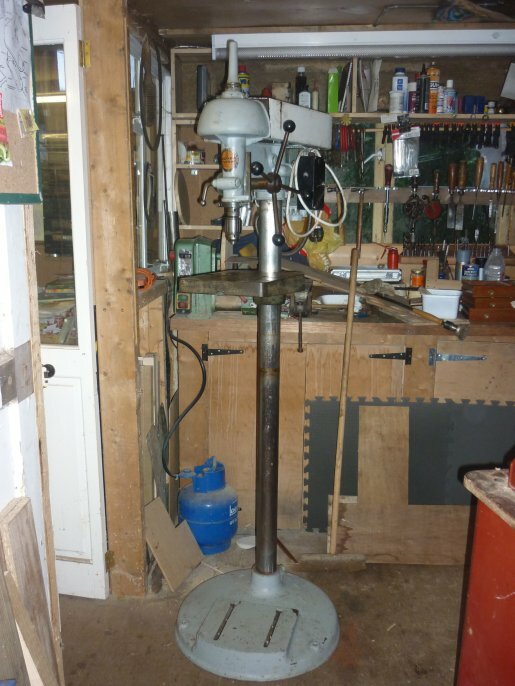 If you really want to see some Walker Turner machinery in all its glory then check out the julian-harrisons-workshop.php I am not fit to wear the apron.